In California, a recent amendment to an existing solar rebate program allows schools and businesses with swimming pools to subsidize the cost of a solar pool heating system. The Viewpoint School in Calabasas recently became the first in southern California to receive a rebate through the program, for the solar pool heater installed on its Lower and Primary School swimming pool. The rebate made it possible to install the solar pool heater much sooner, and start saving energy immediately. That overwhelming sense of community may be the Viewpoint Patriot’s secret weapon, responsible for the team’s winning history; the boys’ team just won its 10th straight league championship, and the girls’ took their 8th in a row. Clearly, the competition pool at Viewpoint High is a place where champions are made. Take a walk across the School’s sprawling campus, past the fragrant rose gardens, there is another pool. This pool is used by students of Viewpoint’s Primary and Lower School, where swimming is a regular part of the physical education program, as well as a component of its summer programs. This is where many of the championship-winning Patriots first learned how to swim. On top of an adjacent building, out of sight of the many swimmers, parents, and faculty below, solar panels – 72 of them to be exact – are now hard at work heating the pool’s water, thanks to an ambitious solar contractor and a new state-wide rebate program that paid for nearly all of the system’s cost. The solar panels, manufactured by Aquatherm Industries of Lakewood, New Jersey, were installed by Catersolar of Woodland Hills. 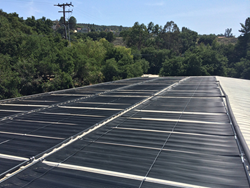 Installation was completed on April 21 and, having passed its final inspections on May 9, became the first commercial pool solar heating system in southern California to qualify for a rebate under the California Solar Initiative (CSI) Thermal Program. Established through the Solar Water Heating & Efficiency Act in 2007, the CSI-Thermal Program was started with the purpose of promoting solar thermal (heating & cooling) technologies in the state of California. The program receives funding through the ratepayers of several major state utility providers, including PG&E, SCE, SoCal Gas and SDG&E, and is regulated by the California Public Utilities Commission (CPUC). By providing rebates based on displaced usage of natural gas, electricity, and propane, Program Administrators hoped to reach their goal of 200,000 systems installed by 2017. Though the solar industry in the U.S. is no stranger to incentives, pool heating applications have traditionally been excluded from receiving such subsidies. “Having a heated swimming pool in your backyard is generally viewed as a luxury, not a necessity” says Molly Friar, Sales & Marketing Manager for Aquatherm. Such was initially the case for the CSI-Thermal Program, until Program Administrators, looking for a way to increase participation in the Program, found their answer in commercial pool heating. According to EPA estimates, the combined heating load of all commercial pools in California produces annual CO2 emissions equivalent to 436,310 passenger vehicles driven a total of 4,934,224 miles. “That makes commercial pools a great candidate for solar heating,” says Sizelove. On September 27, 2012, California State Assembly Bill 2249 was signed into law by California Governor Edmund G. Brown—marking a huge step toward a level playing field for commercial solar pool heating in the state. As a result of AB 2249, facilities with commercial pools are now eligible to install a solar thermal system to heat that pool, and take advantage of the CSI-Thermal Rebate Program. Adams says the school had been looking at putting in a solar electric (photovoltaic) system for some time, but it was a phone call from Roy Aghdam, owner of Catersolar, that he says made administrators shift their focus to one of the largest consumers of energy – its swimming pools. Solar panels can operate as a standalone heating system, or work in tandem with existing gas or electric pool heaters as a ‘hybrid’ configuration. In a hybrid system, solar acts as the primary source of heat and is supplemented by an existing heater. Previously, water from the 3,500 square foot pool at Viewpoint was heated exclusively with two Raypak 400,000 Btu gas heaters, circulated by three 2-horsepower Hayward SP 3220 EE pumps plumbed in parallel. In order to move the required 220 gallons per minute of pool water up to the 3,402 square feet of solar collector area, Catersolar installed two 1.5-horsepower Hayward SP 3215 EE booster pumps. A Pentair Suntouch controls system automation, turning it on and off as necessary to maintain the school’s desired pool water temperature. The system is expected to provide the school with an estimated annual energy savings of 8,432 therms of natural gas. Based on that figure, Viewpoint School is slated to receive a rebate of $59,024 out of a total project cost of $60,001. CSI-Thermal installation guidelines require the integration of customer performance monitoring (CPM) in most projects installed under the Program. To satisfy this requirement, Catersolar outfitted the system with a Badger Model 3050 Energy Monitor, which measures and displays flow rate, flow total, energy rate, energy total, supply and return temperatures, and/or Delta T. Based on early CPM data, the Viewpoint project is already exceeding expectations, having displaced 855 therms in only the first three weeks of operation. For their support throughout the project, Mr. Aghdam extends his gratitude to Mr. Dave Sizelove, President of Aquatherm Industries; Mr. Victor Pesiri, Director of Facilities and Construction at Viewpoint School; and Mr. Alex Ferassati, Environmental Service Supervisor for the City of Calabasas. Aquatherm Industries is the largest manufacturer of solar pool heating systems in the United States; the only U.S. manufacturer of NSF listed solar pool heaters, and the only U.S. solar collector manufacturer to achieve the ISO 9001:2008 quality standard. Aquatherm manufactures several of the industry’s leading brands of solar pool heating collectors, including the Solar Industries, Ecosun and Ultrasun solar pool heating collectors. Aquatherm’s entire manufacturing process takes place at its 50,000-square foot technology center in Lakewood, NJ - the most modern facility of its kind in the world. For more information on Aquatherm Industries, its products or its dealer network, contact Molly Friar, Aquatherm’s Sales & Marketing Manager at 1-800-535-6307, extension 226.